C4Rivers Chatter: 2019 off and running! Earth Day Event April 20th! Due to weather forecast, C4R will postpone the Chicopee RBT clean up set for this Sat, 4/20 to a new later date – TBD. April 11, THU – C4R night at the Iron Duke — Thanks to all who came by! 4/20, QQLA clean up @ 9 AM, Quaboag Pond Launch- ??? Details on these: See Events. As we get out on and around our local rivers, write your poems & prose, take pictures of your favorite river places. Come summer, C4R will introduce an event to celebrate these. Details in May. 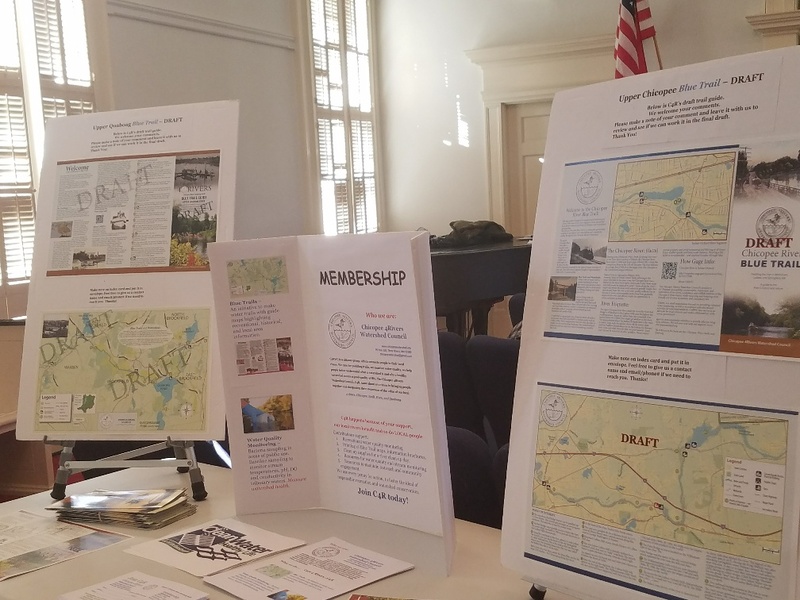 C4R presented our plans for the Chicopee River Blue Trail – a paddling trail ON the river, shared a draft trail map, upcoming event information, and more! Folks discovered how they can connect with our local rivers. All enjoyed a local brew along our local river. 100 State St #122 Ludlow, behind the Ludlow Mills, near the river walk. Thanks to support from QQLA, LWPA, Towns of Warren, Palmer, Wilbraham, Ware, City of Springfield, and Country Bank. 2018 was another productive year for the 4 Rivers group, we continued to advance our goals of reconnecting local folk to their local rivers. This has happened because more local folk have begun to work with C4R. It’s been a slow process, but it has begun to spread. We hope though, to engage more people to Care 4 Rivers. Join us! Over 40 volunteers got involved! Thanks. C4R annual meeting November 4: a success. Fine turnout @ Palmer Historical Cultural Center in Three Rivers/Palmer. Theme: Many hands, together, make a difference! C4R shared updates on Blue Trails, water quality monitoring, recognized our volunteers, presented future plans, and more. 2018 was another productive year, but there is more to do! Join C4R and BE 1 of a 1000! Quaboag Blue Trail closer to completion! Road signage installed: Brookfield to Warren! Trail Maps ready too! Trail map on our Blue Trails page. Draft Chicopee Blue Trail Map ready for review comments! Join C4R, Be a member! C4R continues our 2018 member/supporter drive. Our goal is to welcome 100+ members! See the charter member perks! Seeking better river access? Want clean healthy rivers? Join C4R. Use the Link below, then go to our membership page, thank you. 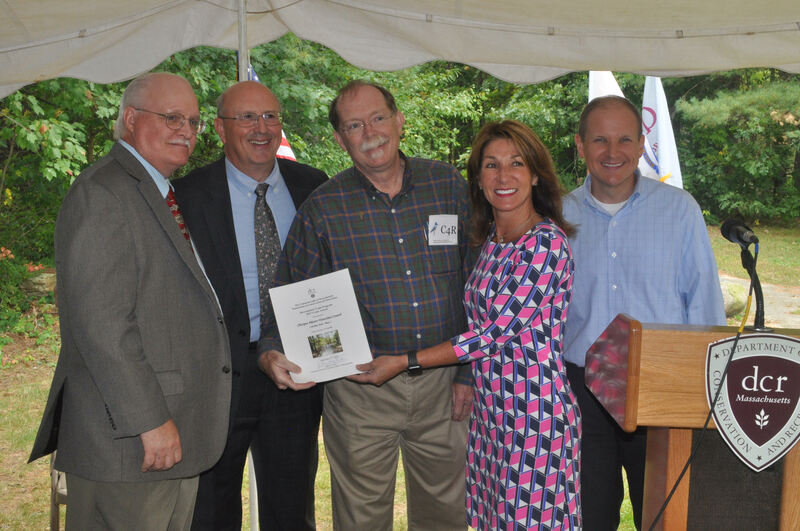 With C4R’s RTP-DCR grant, we are moving forward to make both the Quaboag and Chicopee River Blue Trails a reality. We have begun fieldwork with more to come. If you want to help, let us know! C4R held a number of OUTREACH sessions to engage local folks to help us prepare final efforts. C4R has shared on a draft trail map and seeks input on refinements. We are implementing the trail infrastructure and continue to seek volunteers to helps us make all this happen. Please review draft maps and send in input ASAP, see our Blue Trail page for drafts. Send in feedback ASAP! Posted on February 17, 2018 April 19, 2019 Leave a comment on C4Rivers Chatter: 2019 off and running! Posted on January 30, 2018 April 2, 2018 Leave a comment on NEW LOGO – What do you think? Posted on December 27, 2017 January 4, 2018 Leave a comment on Thanks to all for 2017! Posted on September 19, 2017 September 22, 2017 Leave a comment on C4R receives DCR Trails Grant! 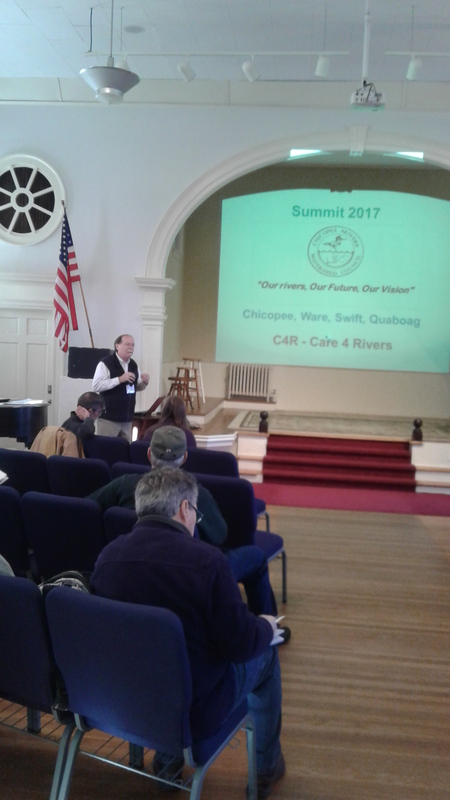 Posted on October 6, 2016 November 14, 2016 Leave a comment on 4Rivers SUMMIT, Saturday Nov 12, C4R getting things done!